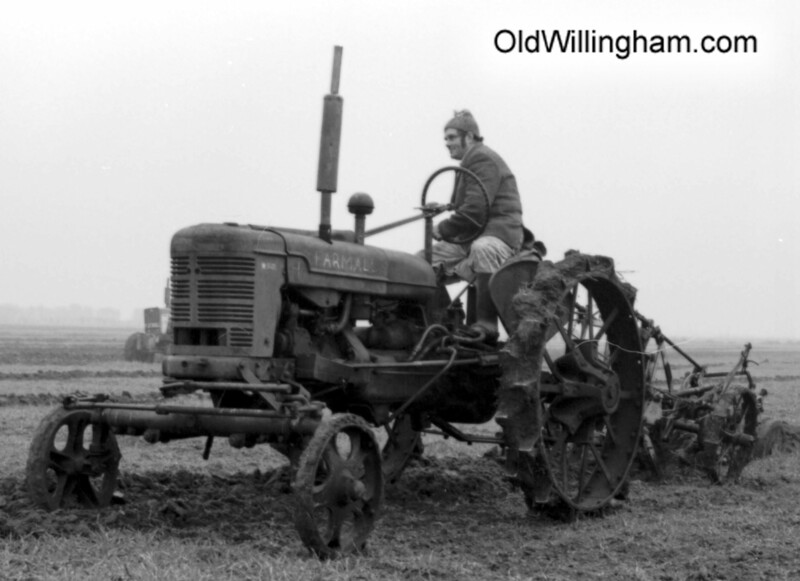 The annual ploughing match has been held for more than 150 years with great rivalry between Willingham and Cottenham. Initially larger farmers employed ploughmen “show-off” to the village. The ploughman had to plough a straight furrow, always 10 chain in length (~200m), covering ALL vegetation from the previous crop in a set time. Each furrow had to be as unbroken as possible giving a “saw tooth” effect; all features needed for good farming at that time. Prizes were also awarded for the “best turned out Team” and many others relating to the horses or team. The farmer paid the entry fee and the ploughman and/or horse-keeper retained any winnings. Everyone was treated to a “feast” prior to prize giving at night, and of course had a day off. The ploughing match continues to this day and is a big event for the local farming community. This moths photo is taken in the 1970 but shows a much older tractor competing – with iron wheels.